North Atlantic climatic signals and the plankton of the European continental shelf (A.H. Taylor). Interregional biological responses in the North Atlantic to hydrometeorological forcing (P.C. Reid, G. Beaugrand). II. Northwest Atlantic Large Marine Ecosystems. Changes to the large marine ecosystem of the Newfoundland-Labrador shelf (J. Rice). Decadal changes in the Scotian shelf large marine ecosystem (K.C.T. Zwanenburg, et al.). Dynamics of fish larvae, zooplankton, and hydrographical characteristics in the West Greenland large marine ecosystem 1950-1984 (S.A. Pedersen, J.C. Rice). The U.S. northeast shelf large marine ecosystem: zooplankton trends in fish biomass recovery (K. Sherman, et al.). III. Insular North Atlantic. Iceland shelf large marine ecosystem: decadal assessment and resource sustainability (O.S. Astthorsson, H. Vilhjálmsson). Ecological features and recent trends in the physical environment, plankton, fish stocks, and seabirds in the Faroe shelf ecosystem (E. Gaard, et al.). IV. Northeast Atlantic. Zooplankton-fish interactions in the Barents Sea (P. Dalpadado, et al.). Dynamics and human impact in the Bay of Biscay: an ecological perspective (L. Valdés, A. Lavin). Iberian sardine fisheries: trends and crises (T. Wyatt, C. Porteiro). The North Sea large marine ecosystem (J.M. McGlade).V. Summary and Comments. 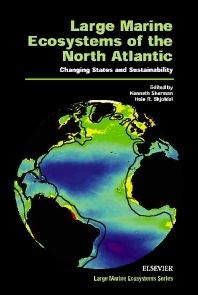 Changing states of the large marine ecosystems in the North Atlantic: summary and comments (G. Hempel). Index. This book will be of interest to marine scientists, resource managers, stewardship agencies, research institutions and laboratories, the academic community, commercial interests, conservation groups, and the environmentally-concerned public at large. Kenneth Sherman is Director of the Narragansett Laboratory and the Office of Marine Ecosystem Studies of the Northeast Fisheries Science Center, National Marine Fisheries Service, National Oceanic and Atmospheric Administration (NOAA); and adjunct professor of oceanography, Graduate School of Oceanography, University of Rhode Island.